One of Canada’s “true” desert golf courses. 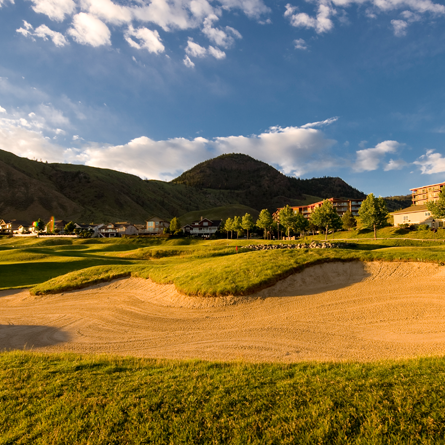 Bighorn Golf blends amidst gently rolling hills and naturally carved canyons boasting sweeping views of the Thompson river valleys. Bent grass fairways, natural sand dunes and gently contoured greens meander seamlessly through a tranquil community and are surrounded by fragrant sagebrush. This par 71, 6,714 yard desert golf course offers five tee boxes in which to choose from, thus providing golfers of all skill levels enjoyment and challenge in their game. Bighorn is only located 5 minutes from downtown Kamloops and the ideal place to golf, dine and perhaps encounter some of our resident big horned sheep. Formally Sun Rivers Golf, Bighorn Golf & Country Club is under new management and looks forward to welcoming you to our redesigned clubhouse and superbly conditioned golf course.